The Smithsonian’s Human Origins Program is excited to participate in the Day of Archaeology 2013! One of the big-picture studies we do at Olorgesailie focuses on how the landscape changed over time, all the way back to the beginning of the sediment record more than 1 million years ago. 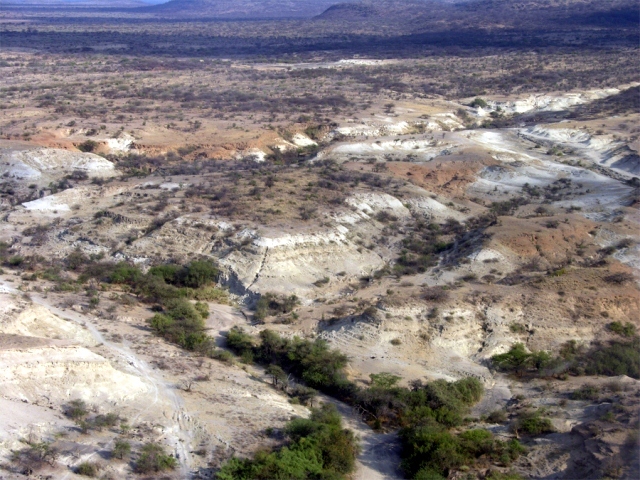 This area of the southern Kenya Rift Valley has the most precisely dated record of archeological and fossil remains in the world for the past 1 million years. 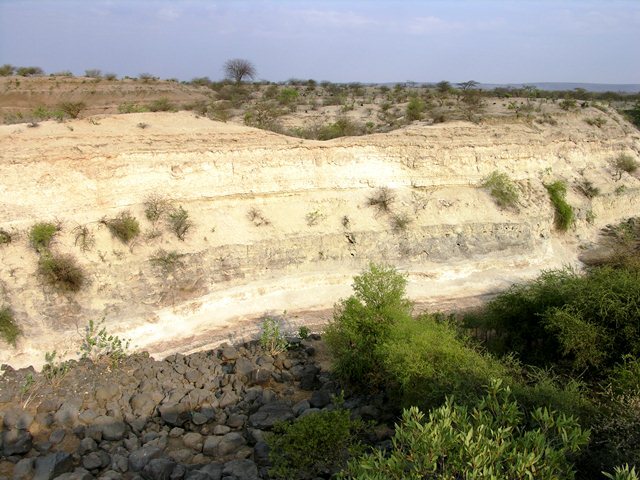 There is only one major gap in the time sequence, between the Olorgesailie and Oltulelei Formations – a gap that resulted from widespread erosion in the region between about 490,000 and 340,000 years. But other than that, Olorgesailie presents a pretty continuous record from the handaxe era up to and beyond the time of the African origin of our species, Homo sapiens. My geologist colleague, Kay Behrensmeyer, and I have been studying landscape change in the region throughout the entire time period recorded in the Olorgesailie sedimentary layers. Kay’s short visit draws to an end tomorrow, as she heads back to Nairobi and flies home to her family. So we spent the morning going over the evidence for landscape change in the younger beds, the Oltulelei Formation, which includes the oldest Middle Stone Age excavations at BOK-2 and nearby sites. Let me provide a couple of images that can help clarify what I mean by ‘landscape change’. Deep erosion along the river unveils many stratigraphic layers. Studying these layers helps us reconstruct how the Olorgesailie landscape changed over hundreds of thousands of years.For example, in the first image, you can see thick white bands and gray bands – where the upper layers were laid down on top of (and thus after) the ones below. The white layer just above the line of rocks and trees is a thick layer of diatomite (look forward to me talking about diatoms tomorrow!). The diatoms in the diatomite show that a large lake once existed at that point in time in the Olorgesailie area. The gray band above it is a thick volcanic sand, which show two things – that there was a volcanic eruption in the vicinity, and that the debris from the eruption filled up wide stream channels that had cut across the region after the lake dried up. So, count ‘em up: that’s three major landscape changes. First, the lake was present and then dried up. Second, the dried-out landscape was eroded and water channels crossed the area. Third, after a nearby volcano erupted, the ash and pumice and gravel was carried into the Olorgesailie region and it filled up the channels to form yet another, different kind of landscape. One thing I’m especially interested in is how early humans responded to these big transitions in the environment. Stone tools were the early humans’ version of a business card – they left the tools behind as if to say ‘We were here!’ Thus we use the stone tools to indicate whether our early ancestors were very successful or not in surviving the major shifts in the landscape, or perhaps repopulating the landscape after an especially difficult time. Just think, 10 centimeters of volcanic ash blanketing the ancient terrain would have killed all the grass, forcing the abundance of grazing (grass-eating) animals to depart. That’s a big drop in opportunities for obtaining meat from those animals. So every landscape change affected the plants and animals – in fact, the entire ecosystem – and thus the early human toolmakers as well. White and gray layers reflect the gradual build-up of the Olorgesailie Formation layers. They indicate many shifts between lake and land from about 1.2 million to 490,000 years ago. The darker brown sediments are ancient river sediments. The narrow brown bands across the present-day landscape represent the erosion of large river channels, which were eventually filled up with silt and sand of the younger Oltulelei Formation. A big question: What caused the repeated cutting of river valleys, followed by silting up of those river and stream channels? 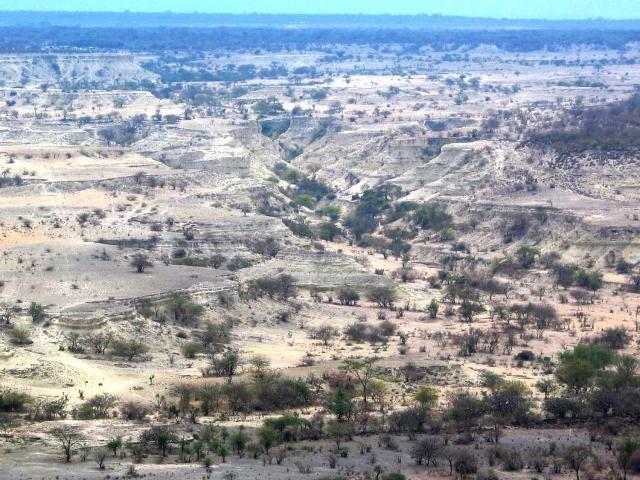 After 490,000 years ago, the largest landscape changes we see were caused as river valleys were cut by erosion into the underlying Olorgesailie Formation. These valleys were then filled up with brown silt and sand. The filling was followed my more erosion as a new river valley formed. This process happened at least 3 major times, and several minor times. The beautiful landscape of Olorgesailie – exposing layer after layer of landscape change, which could have resulted from climate shifts and earthquakes. Kay and I discussed two main causes: Earthquakes or climate? Earthquakes could have caused uplift of the Olorgesailie region, with rain and wind then carving out channels and creating valleys in the high ground of the uplifted landscape. The other possibility is climate. That is, during dry times, the water levels across the region would have dropped, causing the occasional rain storm to carve the landscape down further and further over many years to reach the lower levels. During wet times, as the regional water levels rose, the rivers and streams would have backed up and slowed, which caused the silt and sand in those flowing waters to be dumped within the channels. In other words, cycles of erosion and deposition, over and over again as climate shifted over time. At present, Kay and I are pretty certain that these big fluctuations of the landscape in the younger geological beds reflect strong climate cycles – that is, big shifts between dry times and wet. As you probably know by now if you have been following us on twitter (@FPANNrthCentral), we have been out at Munree Cemetery in Tallahassee today. We have been working with specially trained dogs called Human Remain Detection Canines, or HRD dogs. They have been helping us to find unmarked burials that are at minimum 100 years old! The Munree Cemetery is a historic African American cemetery with over 250 known burials, most of which do not have any type of marker present. Some of the graves are visible at the surface, but some areas we were unsure about. Of course, we wanted to avoid excavating in a cemetery, so we brought in the dogs! Two of the dogs and their handlers came all the way from Louisiana to help us out today! We also had a local dog handler and her HRD dog volunteer to help us out. The dogs were able to identify several areas that possibly contain human burials. Tomorrow morning we are going to bring out the ground penetrating radar (GPR) to see if we can find any anomalies in those areas. The cemetery is five acres, and it would take us days to GPR the whole thing, and even longer to process all that data, so the dogs have helped us narrow down the areas to those that have the greatest probability of containing burials. Jada and Dixie, both specially trained HRD canines, traveled all the way from Louisiana with their handlers to help us today! Marlies Janssens (Vestigia BV, The Netherlands) is analysing Dutch soils today. Vestigia BV, a Dutch company, operates in the field of commercial archaeology primarily as a consultant to policy makers, project developers, spatial planners on the role of cultural heritage, archaeology and history, in corporate, social and sustainable development. Colleague Marlies Janssens is conducting fieldwork today, with the aim to test the predictive model that was constructed based on desktop survey. “Six in the morning: no office outfit for today. I’d better wear an old pair of jeans and firmly tied shoes. Because in my job at an archaeological consultancy company I’m not only working at the office. Several days a month I’m out in the field all through The Netherlands. Today is one of those days. Together with one of my colleagues, in a car filled with geological and archaeological equipment like hand corers, sieves and sample bags, we’re heading for the cover sand region in the province of Brabant, The Netherlands. The local authorities here have asked us to develop an indicative map of archaeological values that can serve as a starting point for their local policy on archaeological heritage management. To develop this map we’ve already been analyzing existing maps (like soil maps, historical maps, geological maps), known archaeological sites and archaeological databases. However, analyzing a landscape from maps and databases will always leave us with questions which cannot be answered by desktop survey only. “What do the soil layers look like?”, “Can we see former landscape surfaces which might have been inhabited during the past? And if so, are these surfaces and soils still intact? Or have they been disturbed by recent human activities?” To answer these questions we’ll have to conduct fieldwork. And that’s what is scheduled for today. We’ll visit several sites as part of a larger project where several colleagues, each with his or her own expertise, will aim to answer these questions. Today we will mainly focus on the landscape an soil characteristics, since me and my colleague are both physical geographers and approach archeology from the landscape point of view. The first stop is at a site which is indicated on the soil map as an ‘enkeerd’ or plaggen soil. This man-made type of soil is often associated with late-medieval farming, when people added a mixture of heath sods and cattle manure to fertilize their arable land. By doing this year after year, they created a thick humic agricultural topsoil. These soils have a high archaeological potential; archaeological remains can be found within this plaggen cover (for the late medieval period), or underneath the cover (for older the period prior to that). After we’ve asked the owner for permission to enter his field, we start coring and find a thick humic sand layer. First, we think that this might indeed be the enkeerd soil as described on the soil-map, but while getting deeper, we start doubting whether this is really the medieval soil we were expecting to find. The humic layer looks very homogeneous, and the transition from the black topsoil to the yellowish cover sand underneath it looks very sharp. Imagine this farmer ploughing his land, blending the black topsoils with the yellowish cover sand year after year. That probably won’t result in a sharp boundary between the two layers. Furthermore, an older soil, which is often found underneath these man-made soils, is completely missing. Looking at the landscape and noticing that this field is extremely flat and somewhat lower than the surrounding areas, we have to conclude that this soil has probably been disturbed recently and is leveled with black sand. Former surfaces or soils are missing, so the archaeological potential might be lower than we would have thought before. The next coring, we had better luck. About a few hundred meters away from the previous site, we’ve found a podzol soil, which is still intact. These soils have been formed in cover sands since the start of the Holocene, about 10.000 years ago. This means that the surface we are standing on now, is the same surface as the one people could have lived on since the Stone Age. Later in the afternoon we were also lucky enough the find a nice undisturbed enkeerdsoil, with remains of an older podzol soils underneath, meaning high archaeological potential for the complete range of historical and even prehistorical periods.